Last week, I introduced you to collegiate gymnastics. To me, one of the most exciting parts of NCAA gymnastics is watching former elites continue to compete in a more relaxed setting. My favorite former elite is Samantha Peszek. 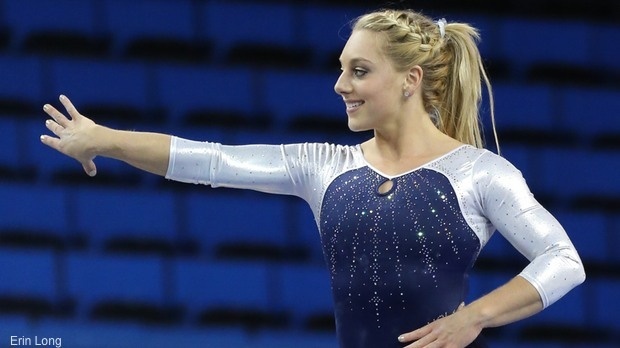 Peszek is a redshirt senior at UCLA and the most consistent and talented athlete on their team. She came to UCLA after winning gold at the 2007 World Championships and silver at the 2008 Olympics. My favorite thing about Peszek is simply that she hits. Routine after routine, she delivers amazing performances without missing a beat. Peszek works incredibly hard in and out of the gym to keep up her fitness and skill level and her dedication shows every time she competes. Last year, Peszek hit every single routine she competed (34-for-34), scoring no lower than a 9.775. So far this year, she has hit all 12 of her routines with a low score of only 9.875. Currently, Peszek is ranked first on beam and second in the all-around. Peszek’s scores paint a good picture of her talent, but what’s even more amazing is the difficulty of her routines. Her beam routine often includes a standing back tuck with a full twist, a skill that few athletes compete even at the elite level. She was the first to compete this skill in the NCAA her freshman year when she won the NCAA beam title. Throughout all of this success, Peszek has had bad luck injury-wise. She suffered a foot injury at 2008 Olympics just before the competition and was only able to compete in one event. Almost every year she’s been at UCLA, foot issues have limited her competition. She also had to redshirt her junior year after tearing her Achilles at the very beginning of the season. Despite these many injuries, Peszek is tenacious and hates being unable to compete. A few years ago, she got tendonitis in her hand during midterms, so she devised a hands-free “bluetooth” beam routine so she would still be able to perform. It’s situations like these that show how committed Peszek is to her gymnastics. She clearly goes above and beyond NCAA requirements because she cares about the sport and wants to be the best. In a short video UCLA Gymnastics released leading up to the start of the season, Peszek admits that when she first started competing in college she was a little disappointed by the lower level of difficulty, as she was used to competing among the best in the world. However, after her redshirt year, she decided to let herself enjoy the gymnastics she was doing and really threw herself into the team. UCLA hasn’t had a great season so far, but Peszek seems unfazed: “I might be a little bit older than some of the other girls but it’s still my job to be at the top of my game and to help lead this team to success.” One of my favorite things about her is her drive to be the best, no matter what. Her team doesn’t have a good shot at a national championship this year, but Peszek continues to dedicate herself and work hard everyday in the gym. I’d love to see her be recognized for all of her work and come away with some individual titles this year. She’s ready to give it her all no matter what the circumstances. Featured image courtesy of Erin Long. Quote courtesy of linked video (https://www.youtube.com/watch?v=7oXJ9E3hHkY).